Just finished a "darkframe creator" lua script. Running the script will start recording 3 second mlv files starting with 12-bit lossless and then change iso from 100-6400. It starts in mv1080p then moves on to 5xZoom mode, then movie crop mode. Not included Crop rec yet. All will be recorden in 24fps and they can then be used in Switch or batch_mlv or Mlv App, mlv_dump for further automation averaging. 10bit files are excluded. Results often worse with 10bit files. Finally managed to clean up and test yet another round of fixes. - other: #2901, menu flicker, some more minor fixes. Let's retry the API tests, hopefully they will pass this time. P.S. I've got everything I need to emulate touchscreen functionality in QEMU on 700D, so I'm going to revisit lua_touch as well. On business travel at the moment, but will test on EOSM and 5D3 when I get back home. Thanks for continuing to push the Lua capability. Looks good on 50D apart the movie stop command apparently not working. I switched to movie mode by entering lv and enabling movie record (simple, not raw) in ML menu, then recording started automatically and wasn't stopping (waited less tan a minute, it should stop after sleep(1)), so i stopped manually by pressing set and exited LV, then assert were triggered. model = "Canon EOS 50D"
Ideally, the camera should be in some continuous shooting mode (not checked). This test requires an electronic lens. This lens does not have variable aperture (skipping test). Please switch to Av mode. Please switch to Movie mode. P.S: A1ex, Do you have more commits to push on lua_fix? Can you have a look why selftest "Small-block malloc test" will not works if I merge this on manual_lens? Edit2: I noticed that lens wasn't screwed, so Af test wasn't enabled. Redone test and first AF test was ok, then it get in a loop trying to focus over infinity and and printing "lens is stuck?" Is there something to focus on? 29...Please trigger autofocus (half-shutter / AF-ON / * ). ML/SCRIPTS/API_TEST.LUA:1362: lens.focus() requires autofocus enabled. Will look into malloc issues, but now I need to take a break, sorry. AF test: maybe worth trying some other lens? Follow focus working? Maybe it breaks after AF test? (you could try commenting out the calls to lens.autofocus). Movie recording test: you could run just that (remove other tests from the script) and see if there's any message on the screen. Maybe add some printf's in movie_end (shoot.c) and see where it fails. It presses SET and checks some pre- and post-conditions. model = "Canon EOS 70D"
Already backtracked code previously because I was suspecting for SET button not pressed as I noticed some times ago that half shutter doesn't work with non raw movie recording in 50D, don't know if it the same for other camera. model = "Canon EOS 7D"
name = "EF28-105mm f/3.5-4.5 USM"
Please trigger autofocus (half-shutter / AF-ON / * ). Focus range: 8 steps forward, 11 steps backward. Motor steps: 1904 forward, 1902 backward, 2 lost. Focus range: 16 steps forward, 17 steps backward. Motor steps: 1902 forward, 1895 backward, 7 lost. Focus range: 45 steps forward, 44 steps backward. Motor steps: 1896 forward, 1896 backward, 0 lost. Focus range: 91 steps forward, 97 steps backward. Motor steps: 1895 forward, 1898 backward, 3 lost. model = "Canon EOS M"
name = "EF-M22mm f/2 STM"
700D is good too. I take it that the 5D3 has been thoroughly tested. model = "Canon EOS REBEL T5i"
Focus range: 9 steps forward, 7 steps backward. Motor steps: 0 forward, 0 backward, 0 lost. Focus range: 34 steps forward, 15 steps backward. Focus range: 115 steps forward, 81 steps backward. That must be from those half-shutter tricks, so we'll probably need to disengage these somehow. Likely returned from PLAY mode to LiveView. Any sort of Canon dialog pops up that would prevent ML from considering that GUI mode as "idle"? Maybe that shooting mode indicator with huge fonts? Can it be disabled from Canon menu? On 500D, there was one indicator telling you to autofocus with the back button, rather than half-shutter. 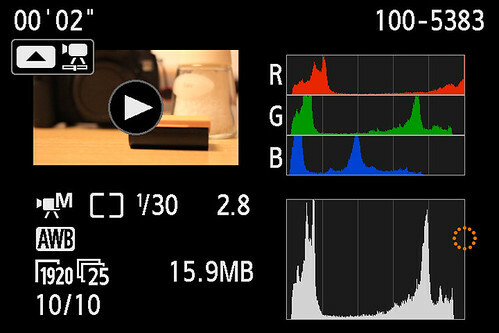 The 500D cannot focus with half-shutter in LiveView. That dialog was pretty annoying after a while, and there was a feature request to remove it (just don't remember where), so... I've disabled that dialog. Right, FPS override missing (and enabling it in its current state would probably fail the test anyway). The 70D may also fail at lens.autofocus(). If you comment out these tests from api_test.lua, do the others pass? That fake_simple_button considering UI locks must be a bit overkill; I should double-check that. At least, the shutter bit should not affect things, so we may leave it out (gui-common.c, try 0xFFFE instead of 0xFFFF). Now it stop the movie Still trigger an Assertion at line 1454 but that's movie review which is not available on 50D. If I enter LV manually, I get in console "UILock: 00000000 -> 41000000 -> 00000000"
when recoding start it prints "UILock: 8300017f -> 41000001 -> 8300017f (!!!)" May be useful to know? Maybe is not halfshutter? Confirmed in QEMU - the 50D does not even attempt to play the movie. So... the only thing we can do is to add an exception. Or figure out how to implement movie playback, but that's a bit more difficult. Confirmed on 5D2; the UI lock change for blocking half-shutter is not yet confirmed when prop_request_change returns, since that's requested from another property handler. Appears to be a false alarm. Holidays are here, so I could finally look into this again. It's both refreshing that I could sit down for a couple of days to troubleshoot some long-standing issues, and frustrating that I could not achieve more than "just" a few bug fixes. Is it ready for mainline? You tell me. Please run the usual tests and report back. Not a prime issue, as I can easily correct in Lua. BTW why do you use two infinities in the Lua module? That is the focus position and dof report infinity as different numbers. Once again, not an issue, just curious. Sure, will check. I was also hoping to add a QEMU test for DOF calculations (i.e. for each focus distance possibly reported by the lens, write down the computed values and compare them to some reference calculator). - focus distance: reported by Canon in cm as 16-bit values; their choice was 65535 = infinity. Lua reports it in mm, so without a special code path to handle this, it ends up as 655350 mm. - DOF code: arbitrary choice made by Trammell many years ago (before I joined); nobody questioned it yet. Lua seems to use math.huge for infinity, but for some reason, it's not printed correctly (possibly related to this issue). As I say, not an issue, as I can handle ‘differences’ in my scripts. 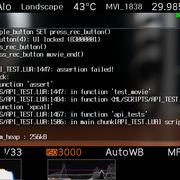 running API_TEST.LUA ended with ERR70 crash when the script was processing movie tests. Crashed in movie mode in funktion movie.stopp. I had to pull the battery. shortcut keys for focus patterns do not work anymore. EDIT: Shortcut keys for focus patterns work as defined as long as back screen is off (neither Canon info screen nor leveling meter should be active). I guess that is as designed, so ignore the previous observation. One strange artefact identified using long-press Q/SET button: the ML overlay symbol for long-press Q/set remains visible after Q button was released. You can see this orange little ring as a sticky symbol even when scrolling through Canon menus or even in Play mode when reviewing a picture. One has to (short) press SET again to let the symbol disappear. Two screenshots available in the download folder. I looked through the issues in Bitbucket and couldn't find anything about this. I'd suggest filing a bug report. Sorry I can't help more at the moment. Your stub test log does show something that I can help with. Test complete, 11688 passed, 14 failed. I'll bet you ran this test in movie mode, right? Try starting the test in photo mode. The test will prompt you when to switch to movie mode. 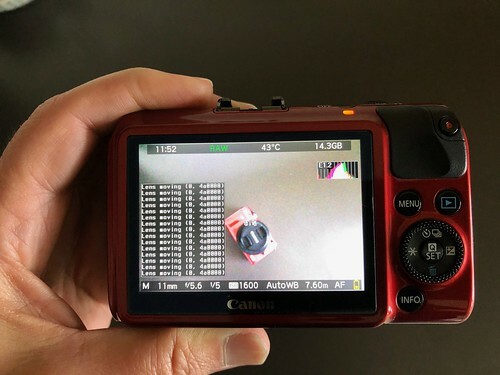 This isn't obvious and I couldn't find anything posted about it but I've been going crazy lately trying to get a perfect test run on the EOSM and it turns out that it is because those tests fail while the camera is in LiveView and being a mirrorless, the EOSM is always in LiveView mode. Test complete, 11772 passed, 20 failed. Test complete, 11782 passed, 0 failed. Hum--interesting that the test that triggers the fail runs 5 times in photo mode and 10 times in movie mode and reports two tests per iteration. Built on 2019-02-26 01:27:33 UTC by scrax@MacBook-Pro-di-scrax.local. Now it's a little better, but still, don't expect miracles. Pretty much "all" I wanted from this update was to pass the Lua API tests. There's plenty of other stuff to fix, that either I didn't address, or I've fixed locally but needs more testing. Many of the issues are likely easy, just time-consuming, others are a little harder. I'll see what I can do. Also, the waveform crash identified by @garry23, and the persistent long-press icon on 100D, should be fixed. EDIT: Found a way to provoke error ... sort of. Just turn cam on and off. Somewhere between 2-5 out of 10 times ISOless error shows up. Was not able to see it 2 times in a row, yet. Can live with that. Yeah, this camera do need a lot of fixing but very good to learn and play with as the issues are mostly "almost already working" state. Great to see lua fixes. Super tool. Got one of these to test Danne's updates, and couldn't believe how broken ML is on this camera. Yay! The EOSM is going to get some more love. Hope you got an EF-M IS lens for your EOSM. Pretty much "all" I wanted from this update was to pass the Lua API tests. Of course I had to try it out. It did get through all of the tests but it was an interesting journey getting there so I thought I'd document it. Hum, been playing around with different settings so better clear out all my Canon settings, format the card, turn on only the essential settings and try it again. Let's see, what are the essential settings I use? 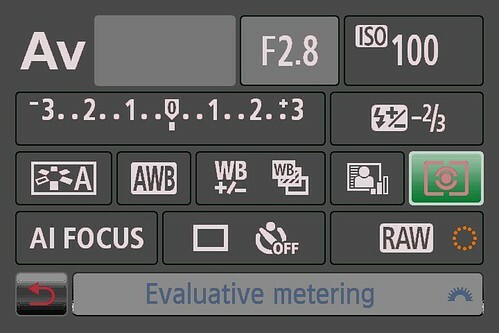 Switch from jpeg to raw stills, continuous shooting mode, fire shutter without lens, turn on back button focus and put it in manual mode. Darn it, wasn't paying attention and missed the user prompt to trigger autofocus. ML/SCRIPTS/API_TEST.LUA:1441: lens.focus() requires continuous AF disabled. Oops, forgot that resetting to Canon defaults puts the camera in continuous autofocus mode. Turned that off. Uh, what's happening? I had an EF-M lens mounted and the lua test has always had problems with these lenses even though these were designed specifically for the M series of cameras. As you can see it is stuck in an endless loop and the lens isn't budging. Turned off the camera before the battery died and found this in the log. ML/SCRIPTS/API_TEST.LUA:1441: lens.focus() only works in LiveView. Switched to an EF lens with the EF to EF-M adapter and finally got through the tests. I did forget to set movie mode to manual but it looks like it got through the movie tests anyway. name = "EF50mm f/1.8 STM"
Focus range: 25 steps forward, 28 steps backward. Motor steps: 2805 forward, 2805 backward, 0 lost. Focus range: 55 steps forward, 46 steps backward. Motor steps: 1786 forward, 0 backward, 1786 lost. Focus range: 164 steps forward, 164 steps backward. Focus range: 170 steps forward, 171 steps backward. Note that there is an error towards the end of the log. Not sure what it means.